The Apollo space programme was the largest technical undertaking of all time and also the greatest adventure of the twentieth century. Travelling to the most forbidding environment known to man, twelve unique and courageous individuals stepped out of their tiny spaceships and onto another world. And then, as suddenly as it had blossomed, the lunar programme was gone. In three short years, nine missions headed to the moon and six landed men on its surface. They explored, they experimented, and then they came home. By 1972 it was over. NASA moved on to other activities. But the fascination with these journeys lives on. 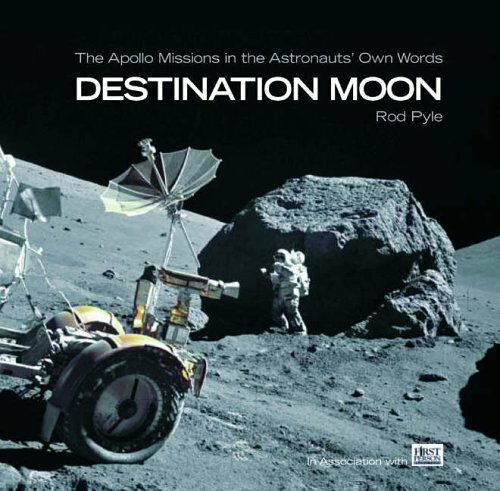 Destination Moon tells the significant, spectacular and intriguing story of the Apollo space programme through first-person accounts by the astronauts themselves - both their mission dialogue and retrospective reminiscences - explained and put into context with expert commentary by Rod Pyle. With more than 100 accompanying images, some rarely seen, Destination Moon is a whole new look at one of mankind's greatest achievements. Rod Pyle is a writer, documentary filmmaker and college professor. A graduate of Stanford University, he has written and produced five documentary films, including the upcoming War Without Mercy. Rod has also written for numerous science and science fiction magazines and periodicals, such as The Astronautics Notebook, Foundation Journal (for the World Space Foundation), Starlog and DreamWatch. In 2002 he wrote and co-produced In Their Own Words: The Space Race, a 7-hour audio book about the US Space Programme through Topics Entertainment Rod lives in California with his wife and son.